"King James Embarks in a Frigate for France," Samuel Wale, 1747, British Museum. The above copperplate was printed for the book "A New History of England by Question and Answer," and depicts the flight of King James II. 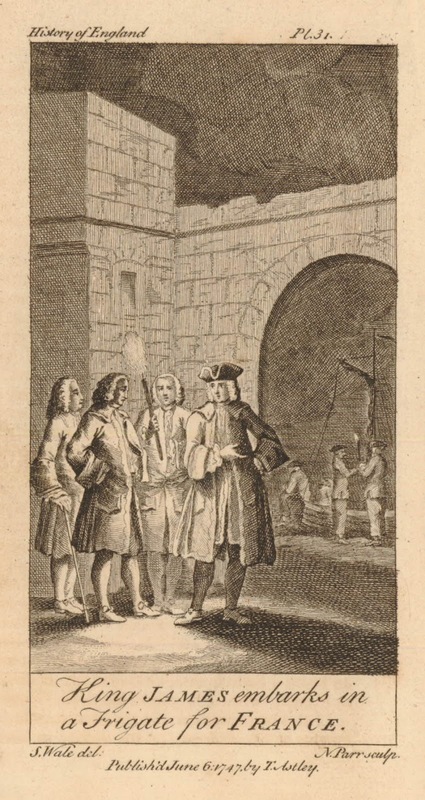 This is a much earlier event than our period of study, probably representing the deposed monarch's first escape in 1690 in the wake of the Glorious Revolution. Interestingly, the artist has made no attempt to pre-date the clothing worn by any of the figures depicted here. This is doubly true of the sailors, who look very much like sailors of the 1740's. The tars wear plain cocked hats with short brims, point forward. Their jackets end about the top of the thigh with one rear vent, and an additional vent on each side. 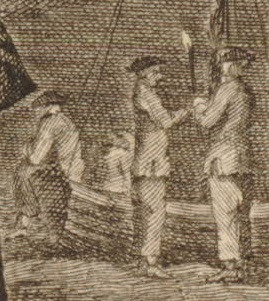 Our mariners' trousers reach to just above the ankle, where they wear plain white stockings.